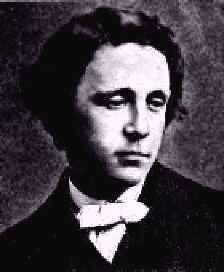 Lewis Carroll was born Charles Lutwidge Dodgson on January 27, 1832, in Daresbury, Cheshire. Carroll was the third child born to a family of eleven children. From an early age he entertained himself and his family by performing magic tricks and by writing poetry for his homemade newspapers. Charles Lutwidge was a great writer, a famous photographer, mathematician, and illustrator. Carroll entered Rugby School, in 1846; twelve years later he graduated with honors in mathematics from Christ Church College, Oxford. He excelled in the study of mathematics and writing. After he graduated, he remained at the college to teach. His mathematical writings include An Elementary Treatise on Determinants, Euclid and His Modern Rivals, and Curiosa Mathematica. Additionally, Carroll began to pursue photography; he often selected children as the subject of his portraits. One of his favorite models was a young girl named Alice Liddell, who later became the basis for Carroll's fictional character, Alice. He abandoned photography in early 1880s and focused on his writing. In 1865, Carroll published Alice's Adventures in Wonderland. Seven years later, he published Through the Looking Glass. Lewis Carroll died in Guildford, Surrey, on January 14, 1898. I have had prayers answered - most strangely so sometimes - but I think our heavenly Father's loving-kindness has been even more evident in what He has refused me. "What is the use of a book", thought Alice, "without pictures or conversations"? The beloved children's story of Alice, who falls asleep and has a most peculiar dream of falling down a hole into a world she has never seen -- complete with the White Rabbit, Mad Hatter, and Queen of Hearts. A poem about the strange voyage of Bellman and his crew's attempt to track down a Snark. The bizarre adventures of two children. Sequel to "Alice in Wonderland," in which Alice must play a game of chess on a giant chessboard in a backwards universe.